I have to credit my husband, Mr. Rad, for this recipe. When he suggested that we try making ginger chews at home, I flashed back to my original thoughts on making marshmallows at home. Ginger chews are not “food” in my mind. Their ingredients could be spun gold, melted wishes, and Hobbit sneezes for all I know. The Mister was undeterred, and I sat back skeptically as he made his first batch of chewy candies. Batch #1 was darn close, and my interest was piqued, I was by his side for Batch #2. By Batch #3 we were feeling confident that we had cracked the code on ginger chews. And with that, I share the recipe with you. Take 1 cup of sugar and place in saucepan over medium heat. 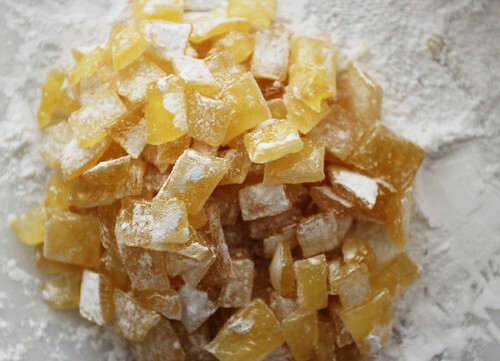 Melt sugar completely until it caramelizes. Add 2 tablespoons maltose and stir together. Add 3 tablespoons fresh ginger juice. Allow mixture to bubble together. Place wax paper on a large plate or cutting board. Generously sift tapioca starch onto wax paper. With your finger, make gentle depressions in the starch and pour candy mixture onto the depressions. While you allow the mixture to cool, sift a bit more tapioca starch over them. Once the pieces are cool enough to handle, use a cold knife and cut the candy strips into bite-sized pieces. Store in an airtight container with ample tapioca starch to keep the pieces from melting together. Enjoy! Notes: This recipe is a work in progress. If one of you reads this, tries it, and can improve upon it, please share your work! We are open to suggestions! These ginger chews work wonders on scratchy throats and pesky coughs. If your local markets don’t carry Liquid Maltose and Tapioca Starch, try theses links. My husband LOVES these…maybe I’ll try this for his birthday next month! Yummmm! My dad and Todd would freak out about this recipe. Maybe I should make a couple batches for fathers day. Also, ginger is really good for nausea. So I’ll be whipping these up next time I get pregnant for sure! Love it, Megan! well maybe Im a little late, but I heard ginger is oxytocic. So you should spare it in your late pregnancy. YoSoyBlog!! Really? I love hearing that we’re on the same wavelength… yours is a great one to be aligned with! What’s your favorite brand of store-bough chews? Jessica I’m a ginger ADDICT! Any time I make juices for breakfast I always put SO much ginger in them (Maybe the punch will help me ween off coffee? PS… any plans for baby #2? I cannot wait!! You are such a great mom! “spun gold, melted wishes, and Hobbit sneezes” ????? MEGAN where do you come up with this stuff!?!!?!? I wish I was half as funny as you are! I read that line and laughed so hard I almost cried. I’m going to use those three ingredients somewhere, somehow. I don’t know for what yet, but be sure you’ll see them again! would it work to substitute maltose with honey? i can’t find liquid maltose (I’m in Toronto) – what could I replace it with? I am wondering why maltose is needed. Commercial ginger chews like chimes have 3 ingredients: sugar. ginger and tapioca. I was thinking of experimenting on my own to reproduce them myself and came across this site. I wonder what will happen if if a) don’t include any maltose at all, b) just stir in a bit of the tapioca starch into the cold ginger juice before adding it to the heated sugar. Did you come up with a recipe using cane sugar, tapioca, and ginger? The hotter the better. Hubby buys this from Trader Joes, but we want to make our own. try adding some lemon juice to the ginger juice! I think that you can substitute food-grade glycerin for the maltose. Glycerin can be used as a subtle sweetener and to keep foods soft, so it would seem appropriate here. You should be able to get it at grocery stores, pharmacies, or Bulk Barn. I have not yet tried this recipe without using the maltose- Sorry, Toronto friend! – but I found OUR maltose at a local asian market- you might try there! If that doesn’t work, try skipping the maltose altogether and cooking the sugar until it becomes a thick caramel- then add the liquid ginger. Then pour it onto the wax paper coated in tapioca powder. If you can’t find tapioca powder either, try cornstarch! I believe light corn syrup can be substituted for the liquid maltose. I am REALLY excited to make these.. I’ve had the ingredients forever but haven’t had a day off to try. Today is the day! Just wondering how you prepped your pan or cleaned it afterwards so as not to destroy it? I am remembering when I tried to make fudge as a kid and decided the ingredients were melted marshmallows and cocoa powder. My mom was not thrilled when her new pan was destroyed! cook it on or below medium and then you can boil water in it for a little while afterwards to dissolve the sugar. These were great! I only used 2 T of ginger juice and they were still a little strong so maybe I’ll try 1 1/2 T next time. We also added some lemon Essential oil to some of the batch to see what it would taste like. Really great taste. Thanks so much for the recipe! I’ve made crystalized ginger but have wanted to try my hand at making ginger chews. Thanks for the inspiration. So excited to give these a try. Love ginger anything! All I could find, though, is dried malt extract. I’ve done a good deal of searching online to find out if I could use it in lieu of the liquid maltose, but my searching has been fruitless. Does anyone know? Can I add water or some such to the dried extract? I’m stumped. 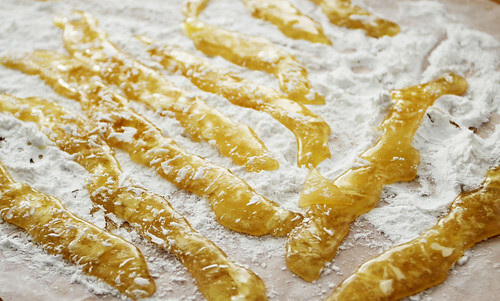 And I’m just itching to make these ginger chews! @pinkpeppercorns- do you have an asian market near you? I found mine here: http://www.99ranch.com/ If you can’t find the liquid maltose, try making a caramel from the sugar and then combining that with the remaining ingredients! Good luck!! This looks a lot like when I’ve made caramel with my mom (brown sugar and butter melted together and when we add baking soda it bubbles up like that!) With that in mind, I wonder if it would do the same thing here without the butter… I’m allergic to corn so maltose syrup is out for me but I eat Reed’s and Ginger People’s chew constantly!! Thank you for sharing, I’m excited to try. I would love to hear about the pan cleaning as well though- with the caramel I think we just washed everything straight away before it hardened… helpful to have 2 people, is it the same here? Maltose is a barley by product, not corn. It almost reminds me of sweet sorghum. Is this added to tone down the ginger? so you put no water in the sugar when you melt it?? Wouldn’t you have to put a little water in it? I really REALLY want to try this.. I have ginger already cooked and in the freezer waiting for me to find the perfect recipe! I hope this is it. I just can’t use the maltose because of the corn.. I’ll try butter and see what becomes of it. AMAZING! I LOVE ginger and recently found a box of Ginger Chews at a speciality market and had to guard them with my life because I thought I wouldn’t be able to find them again and NOW I CAN MAKE THEM. To make ginger juice, puree ginger and press through a sieve. I needed to add a few tbsp. of water to have my blender puree the ginger. Mix together ginger and lemon juice. 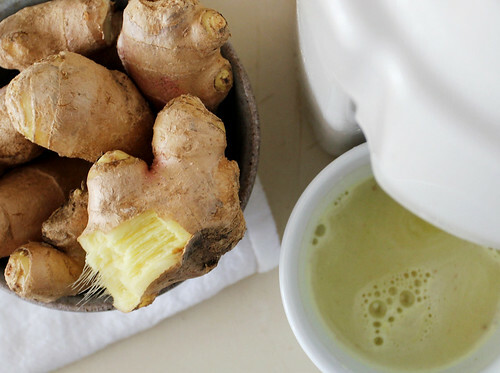 Add extra ginger power to taste. Put sugar and corn syrup in a thick bottomed pot. Heat on medium stirring slowly with a silicone or wooden spoon. When the mixture is smooth and starting to bubble, measure temperature. Heat to 310F. Take mixture off heat and slowly and carefully stir in ginger/lemon juice. Mixture will be crazy bubbly. When the mixture is all smooth again, return to heat and heat to 248F. Make sure to stir the mixture on the bottom of the pot to reduce chance of burning. Poor into a small heat proof pan lined with greased parchment or aluminum foil. I used a 7×7 ceramic dish. Let cool, cut into squares and wrap in small squares of waxed paper, or coat in corn starch to prevent sticking. Reduce ginger juice to ½ cup. Stir in ½ cup peanut butter (natural or not,crunchy or not, if all natural add a pinch of sea salt) to juice. Do not add lemon juice. Heat mixture in microwave to help the peanut butter mix. Proceed as previously with recipe. Make sure to stir well after adding peanut butter mixture, it will start to burn as it reaches close to 248F. Before pouring into pan, stir in one more tbsp. of peanut butter. To keep this recipe hot for congestion and allergies like those we bought from Trader Joe’s I would use cane sugar not white or corn syrup. Gin Gin Ginger Chews have tapioca, cane sugar, and ginger. I am going to try and juice ginger after I peal it…easier on the juicer. What do you think of substituting arrow root for the tapioca/cassava/cornstarch? You could use the arrowroot, but it’s very expensive compared to tapioca starch! Hey Guys, I was experimenting a little while making these and found a way to make them without liquid maltose and chewable! First I made a batch following this recipe, just to see how’d they’d turn out and Megan was right! You cannot chew those suckers! But I was determined to find a way to replicate the texture and taste of chimes ginger chews! Anyways, taking Megan and all the advice from the comments, I think I found a way to do that’s pretty easy!! I thought I would share! just cut the strips up and you’re done! You have yourself some homemade Chimes inspiried ginger chews! Granted, the recipe isn’t perfect and the texture is still isn’t close enough for my liking… but I thought I would share what I learned! I will be working on perfecting it soon! I have seen on a turkish delight recipe that they used 1 tsp of cream of tartar, with cornstarch or tapioca starch. 4 simple ingredients and stunning photographs – could this post be any better! 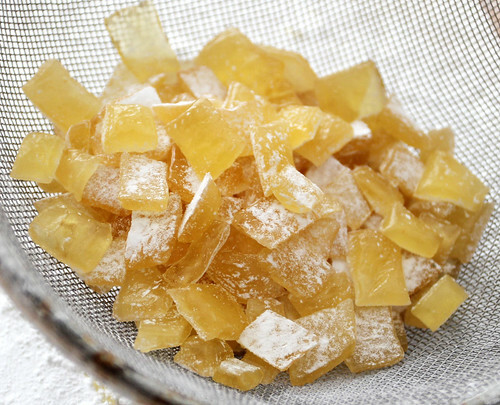 I love ginger chews and have always wanted to know how to make them. Megan has nailed it and I feel so good when I find someone willing to take the time to make a post like this one. Thank you Thank you Thank you! I’m going to try my hand at making these today and hope that mine turn out as beautiful as Megan’s. Were it not for her wonderful step-by-step instructions WITH pictures this would be impossible for me as I’m not a very good cook. Thanks again for taking the time to figure out how to make these! These people stole your picture? What if I don’t have a juicer??? What if I don’t have a juicer? I simply peeled the ginger and put it all in the food processor chopped it to a fine paste (added 1/4 cup of water) and pushed it through a fine collander. I try to use local sugars. 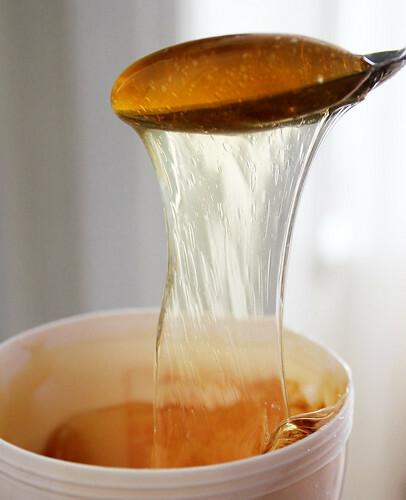 Is there a way to use honey or maple syrup instead of the sugar and maltose? Thanks! Might try a grocery store like a Peoples Co-op or a big store that carries organic foods and baking goods and spices. I know I will be checking for these ingredients also. I am interested in making these chews. Might try a Peoples Food Co-op grocery store, or a big stores that carries organic food and baking supplies. We have a store named Woodman’s, that carry lots and lots different supplies for baking especially odd ingredients. I know I want to try this ginger recipe and will be looking for the supplies also. Just one thing, how do you juice ginger? It is so little it would get lost in a big juicer. Good luck to both of us. As an oncology nurse, I have advocated for the use of ginger for anti-nausea for a good while. It helps remarkably, in any form, some prefer using ginger in all their cooking, some want cookies, or gingerbread, some drink ginger ale, but no matter what form, it does help, thank goodness! I made these and they are delicious. I’m wondering though how i could make these end up harder at the end. right now, when i finish, they are very soft. I’ve rolled them in starch and wrapped them each in wax paper, but if i don’t keep them in the fridge, they stick to the paper. i used both the wet and dry methods of caramelizing sugar, but my results came out remarkably similar. I also tried skipping the corn syrup (in place of the liquid maltose) and it didn’t make much of a difference either. One other thing i am curious about, since i don’t have a juicer, i have just thrown my ginger in the blender, and then used my Aeropress to squeeze out the juice. in order to get everything chopped up fine, i need to add a few tablespoons of water to the ginger and blender. maybe this is contributing to the softer consistency at the end? Instead of juicing the ginger I will grate it using a fine grater. Add to caramelized cane sugar and pour on wax paper. Hi! I just wanted to share my experiment based on zero candy making skills, lack of thermometer and ingredients also lacking, but based on pure love for ginger chews (that I am unable to find. I just thought, well I will eat it anyway so why not give it a try; my hand at ginger chews! Anyway, I am glad I gave it a shot! I started with some ginger juice (about 1/4 cup) that I extracted by squeezing grated ginger pieces. Next, added 3/4 cup sugar and started heating my pot on med-high. Then, when it started boiling, I set timer for 5 minutes. In the meantime, brushed my pot with some water to clear the sugar crystals on the side. Then after 4 minutes, I just went ahead and added lemon juice (about 1 tablespoon) mixed with 1 tablespoon tapioca flour while stirring continuously for like 1 minute. Then I poured the mix into my prepared baking sheet lined with parchment paper and tapioca flour. And then sprinkled some more on top. And it tastes GREAt… So far. I don’t know how long I need it to set. But, looks like some kind of jelly candy like jelly beans! Has anyone tried to make the the mango ginger chews? I need some serious help with these :/ Ive tried your recipe a few times and i cant get it to turn out right! this last batch turned out really grainy and breaky like old caramel where it just breaks and smushes into soft sugar instead of being a harder/chewier texture. 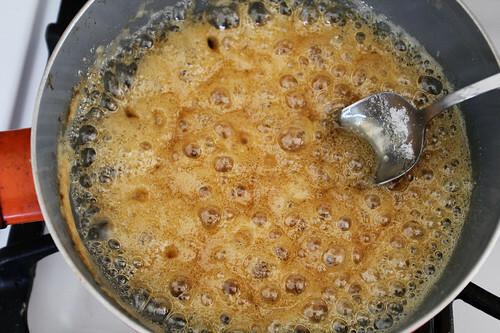 Do you stir the boiling sugar the whole time or just leave it alone once it has all melted? and how long do you let it cook once it is melted? do you keep track of the temperature? Ive tried starting without water to melt the sugar as well as with about a teaspoon of water. I also find that adding the ginger juice once the sugar is boiling is very dangerous because then it goes spitting all over the place.. I am really a noobie at sugar cooking and just need some more detailed instructions for my home made gin gins please help! I’m so glad I found this recipe. It gave me the starting point for making these chews and they’re so good. I’ve adapted it to using equal parts ginger juice and sugar (1/2 cup of each in my last batch plus about 1 tsp of tapioca starch mixed into the juice) and dissolving as much of the sugar as I can before heating on medium to 250 degrees (I’m in Denver). I pour the mix into tapioca dusted silicone molds to make them pretty and let them sit for an hour until I chow down. Thanks so much for the inspiration! Hi, I would love to try this recipe, however, before I do, I have a question. Instead of using ginger juice, will grated ginger root work as well? Can’t wait to try the recipe. I live in South Florida and my daughter started easily getting motion sickness. The Chimes Ginger chews saved her Yep, it’s not just for sore throats. So, I decided to look for a recipe similar to those. I hope this works!! Thanks.